Ever since I was a child, when I would willingly wake up at 7 o’clock in the morning, my mother always told me to “eat my breakfast, it’s the most important meal of the day.” I never really questioned her, I mean I was a child. But this idea of breakfast being the most important meal of the day was blasted everywhere. I saw it in school, on television, and especially around caring parents. But now I finally question it, for why would this meal be more important than any other meal? Aren’t they all just sources of calories needed for everyday energy? So, what is the evidence that breakfast is most important? We must first establish what we mean when we refer to “importance”. When talking about food, we look to the digestive system. Food gives us energy to take on the day, but overconsumption can lead to weight gain and under-consumption can lead to weight loss. When we look at the response variable of weight within the changes in the digestive system, what is happening with our metabolisms is what causes such changes. There is popular belief that eating breakfast, rather than not eating, boosts and regulates your metabolism. Metabolism is the process of turning food into energy and waste. By boosting your metabolism, you are able to convert more calories into energy, in a way thought to assist you in losing weight, if that is your goal. However, in a recent study completed by the University of Bath in London, they have concluded otherwise. 33 volunteer participants were randomized in the study, to compare Body Mass and cardiovascular indexes between the two groups of “breakfast eaters” and “breakfast skippers”. Based on the results, neither group showed significant findings, as there was not a great enough change in body mass to affect resting metabolism. Although, eating breakfast did cause more activity of thermogenesis within the body. However, we can only conclude based on this study, that people in London have no change in body mass depended on whether or not they eat breakfast. We also cannot conclude that losing weight is any healthier than gaining weight. Another belief is that breakfast prevents one from over eating later on in the day. This belief is countered, because it has been found that it is what is in the breakfast that will prevent one from overeating later on. 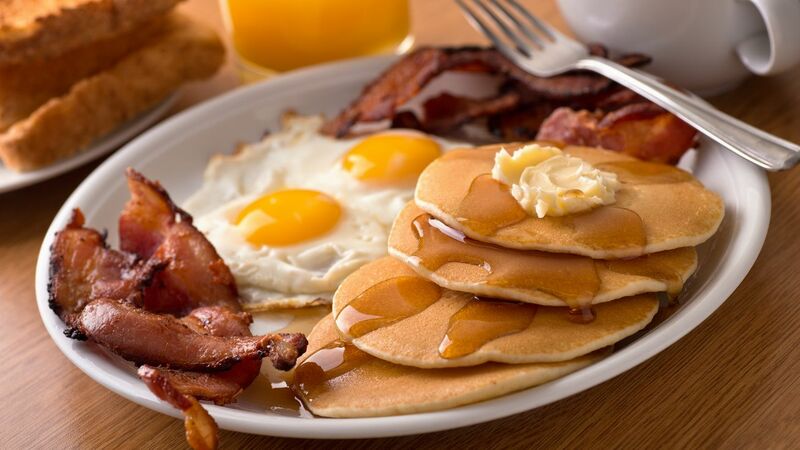 In another study completed by The Obesity Society, 57 participants were randomized and split into 3 groups, either eating a high protein breakfast, relatively normal protein breakfast, or no breakfast at all. This test was completed over 12 weeks. To examine hunger, they assessed future intake and ending body weight. The high protein diet prevented the participants from gaining fat mass and reduced consumption (in calories) daily. This goes to show that breakfast is just a time to eat. Our weight is dependent on total calorie intake versus expenditure. Eating vs. not eating breakfast does not mean you will consume less later, and it is now recommended to eat when you are hungry, but in moderation, as three-core meals now make one feel obligated to get all the calories in at once. Rather, we should place importance on the content of our food. High protein diets show a decrease in overall consumption, benefitting those that want to consume less every day. If one tends to eat more calorie filled carbohydrates and fatty foods instead of protein and nutrient rich food, not only will they tend to eat more, but their body indexes will take a turn for the worse. As a college student, I now do not feel obligated to eat breakfast, especially since I am not really hungry in the morning. I would rather eat when I am hungry, or when there is a need for energy, instead of forcing food down my throat because of popular belief. We can conclude that breakfast is not the most important meal of the day, as no meals really are. All meals are the same, simply times to take in calories. When we go to the commons for food, we should eat for the nutrition, not for the timing. Otherwise, I’ll be forcing senseless carbs of donuts, muffins, and French toast sticks in my stomach. This entry was posted in Uncategorized on October 11, 2016 by Dante Labricciosa. I was interested in reading this blog post because I am a non-breakfast eater. I usually just wait until 12 o’clock to eat food and it is usually lunch food because I sleep in until about 10. I always find myself questioning whether this is actually counterproductive to weight loss because of the notion that “breakfast is the most important meal of the day.” After reading this post I am going to stick to just eating when I am hungry because it doesn’t seem to matter due to the studies that you referenced. I think you did a very good job with this post! Breakfast is easily my favorite meal of the day. Instant oatmeal isn’t glamorous, but it gets the job done. I, like John, don’t 100% agree with the results of these studies. Breakfast is such a key factor in waking up your metabolism for the day, especially after a long night’s sleep. Also, it is important to keep in mind how small the studies were! Maybe think of a way that you would set up an experiment to test this hypothesis! Overall excellent job! I LOVE breakfast! Just thinking of missing breakfast makes me extremely hungry as I write this. I need to get my serving of protein to get through the long school day. Do you think that eating in the morning can sustain your hunger all day? I’d say it may be an extra benefit to cause you to want less food throughout the day. This is the reason why those who are trying to keep a healthy weight eat larger meals earlier in the day. So combine that with small means throughout the day, and it should boost your metabolism. There are certain foods that will boost your metabolism more than others. Below I’ve attached a link of foods that will boost your metabolism. What’s up Dante. This is a great blog; however, I disagree with the idea that breakfast is not that important. Breakfast may not be the most important meal of the day but it is pretty important to eat early to allow our bodies digest and use the food as energy throughout the day. This is extremely important if you are performing anything throughout the day; for example, exercise, an exam or any sort of physical activity. You need to have food in your system in your body so you are able to focus on whatever you are doing without thinking about how hungry you are. You also use a lot of energy when doing physical activity so it is extremely important to eat before working out. This is from my personal experience and i am attempting to gain weight this winter so i am going to continue eating breakfast everyday, even as a college student. Overall, good blog, keep it up. This made me really think of the concept of intermittent fasting. This is a concept preached by Greg O’Gallagher in his Kinobody fitness lifestyle. Intermittent fasting is not a diet, but rather a pattern of eating. The pattern goes that you don’t eat for about the first 6-7 hours you are awake during the day. After that you eat normally. You mentioned in your post that it is just about total calories consumed but intermittent fasting goes against that. The concept behind intermittent fasting is that your body burns more fat calories than muscle calories in the first 6-7 hours of being awake. Some have argued that skipping breakfast slows your metabolism and that has been countered with your body will get used to it. Now of course it is all dependent on the individual for the most part, people’s genes work in different ways, but O’Gallagher claims it to be effective. If it stands to be true and effective, the time of day you eat would matter for someone following the program.